There have been a lot of great stories to come out of Colorado this season, most of which have been covered by The Hockey Writers. Matt Duchene being named to Team Canada, Patrick Roy and Nathan MacKinnon having incredible rookie seasons, Ryan O’Reilly’s PIMS (or lack thereof) and Varlamov’s Vezina-like season have all garnered much attention in main stream media. 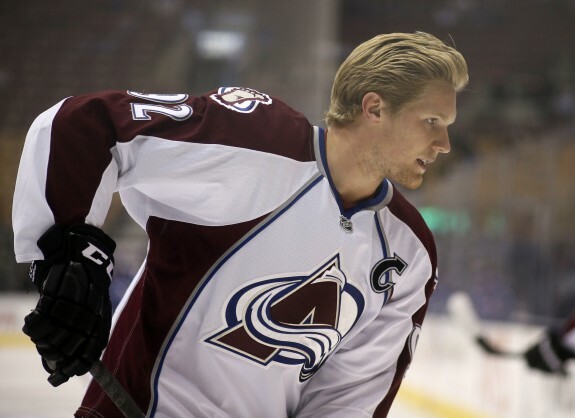 However, there has been one rare, but major oversight when accrediting the success of this Colorado team; and that is the play of the captain Gabriel Landeskog. Despite putting up 36 goals and 66 points in only 53 games in his draft year, some scouts questioned the young Swede’s ability to produce at the NHL level. Edmonton Oiler’s head scout Stu MacGregor projected Landeskog as “athird-line player who could be a good second line player” so it’s not surprising they went with the Nuge. Landeskog has quickly proved MacGregor and any of his other doubters wrong. It seemed the team could count on Gabe when they needed it most. That’s why it was no surprise to anyone that followed the Avs that he was named the youngest captain in NHL history at 19 years and 286 days old. Many people outside the Avalanche questioned the decision, thinking it was too early or that there were better options like Paul Stastny, Ryan O’Reilly or Matt Duchene. Landeskog’s first season as captain probably wasn’t what he had in mind – and his doubters began once again became vocal. He suffered a concussion in just the fourth game of the season, forcing him to miss a month of a lockout shortened season. By the time the young captain returned, the Avalanche were third last in the conference and six points out of a playoff spot. Landeskog would not be able to salvage the Avs season, and finished with just 17 points in 36 games. As we know, the Avalanche have done a 180 degree turnaround this year, and Landeskog is leading the charge. Many have criticized the merit and use of advanced stats – and they can get rather ridiculous – but advanced stats were created to show a player like Landeskog’s worth. Although he won’t always be lighting up the score board, he contributes in a number of ways to help his team win that aren’t the easiest to quantify. For example, how do measure a player’s ability to gain the opposition’s blue line? Or prove to non-observer that he is always first on the back check? I would wager he spends more time behind his own net than any other winger in the league – but there are no solid statistics that exist to back up my claim. What is important is that his teammates see it, and when your captain is doing all the nasty, little things on the ice to make the team win – you follow. Here is what we do know for sure. Landeskog leads the Avalanche in plus/minus at +23 and hits with 172. He is keeping some pretty good company in the ‘power forward’ department as well. #Avs captain @GabeLandeskog92 is one of two NHLers with more than 25G, 60PTS, 65 PIMs and 200 shots this year. Corey Perry is the other. He also ranks second on the team in goals (26), assists (38) and points (64); setting career highs in all categories. What’s more amazing is that he is tied for 3rd in the league when it comes to scoring at even strength, and is leading the league in 5 on 5 primary assists. The guy has only 2 secondary assists at even strength all season! When you consider what he does on the defensive side of the puck, Landeskog is beginning to assert himself as one of the premier two way wingers in the game at only 21 years of old. Look for Landeskog to have a breakout playoff performance. He has noticeably stepped up the intensity in his game down the stretch (in what has been affectionately referred to as “Viking Mode” or #Mandeskog) – especially when the Avs lost Matt Duchene to injury. In the first game without their leading scorer, Landeskog tied the game with under 5 minutes remaining and added the overtime winner against a desperate Columbus team. His power forward type of game is suited for the post season, and it will be his first playoff appearance in the NHL. In 27 OHL playoff games Landeskog recorded 33 points. Which is good, because with Duchene out Landeskog will be asked to carry most of the offensive load. Something tells me that the NHL’s second season is where Landeskog will create his legacy.